Annibale Carracci, Allegory of Truth and Time (1584-5), an allegorical history painting relying very little upon realism. A genre painting. 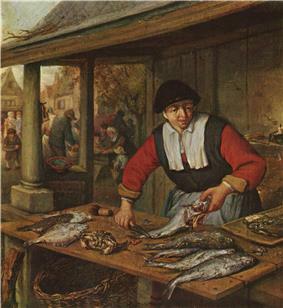 Adriaen van Ostade, Fishmonger, 1660-1670, oil on oak, 29 × 26.5 cm, Museum of Fine Arts, Budapest. A landscape. 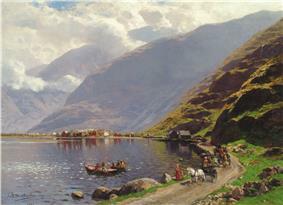 Themistokles von Eckenbrecher, View of Laerdalsoren, on the Sognefjord, oil on canvas, 1901. A still life. 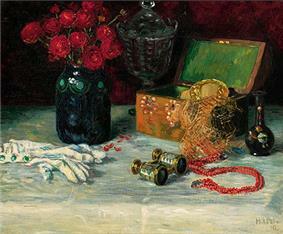 Heinrich Uhl, Still life with Jewelry Box, Opera Glasses, Gloves, and Bouquet of Flowers, oil on canvas, 50 x 60 cm. 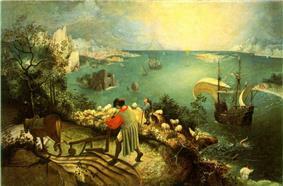 Landscape with the Fall of Icarus, after Pieter Bruegel, an original treatment of a history subject dominated by a genre figure. Pythagoras Advocating Vegetarianism (1618-20), by Peter Paul Rubens (figures) and Frans Snyders (still life), mixing history painting and still life in a way typical of Flemish Baroque painting. Paulus Potter, The Bull (1647); 3.4 metres wide. 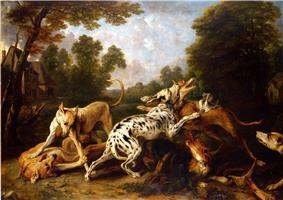 An unusually monumental animal painting that challenges the hierarchy of genres by its size; in the 19th century such works would become common. 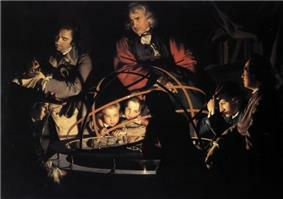 Joseph Wright of Derby, A Philosopher Lecturing on the Orrery, 1766, a conversation piece with no portraits and with the full seriousness of the history painting. 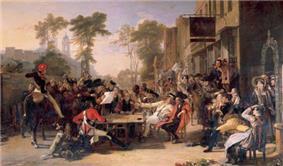 Sir David Wilkie, The Chelsea Pensioners reading the Waterloo Dispatch, 1822. Genre or history painting? The types have merged, in a way typical of the 19th century. In music, settings of words were accorded a higher status than merely instrumental works, at least until the Baroque period, and opera retained a superior status for much longer. The status of works also varies with the number of players and singers involved, with those for large forces, which are certainly more difficult to write and more expensive to perform, given higher status. Any element of comedy reduced the status of a work, though, as in other art forms, often increasing its popularity. ^ Giovanni Battista Armenini (1533-1609) De vera precetti della pittura (1587), " On the True Precepts of the Art of Painting". ^ Inleyding tot de Hooge Schoole der Schilderkonst ( Rotterdam 1678), "Introduction to the Academy of Painting". Romanticism greatly increased the status of landscape painting, beginning in British art and more gradually that of genre painting, which began to influence history painting in the anecdotal treatments of the Style Troubadour in France and equivalent trends elsewhere. Landscapes grew in size to reflect their new importance, often matching history paintings, especially in the American Hudson River School and Russian painting. Animal paintings also increased in size and dignity, but the full-length portrait, even of royalty, became mostly reserved for large public buildings. Claude Lorrain practised a genre called the ideal landscape, where a composition would be loosely based on nature and dotted with classical ruins as a setting for a biblical or historical theme. It artfully combined landscape and history painting, thereby legitimising the former. It is synonymous with the term historical landscape which received official recognition in the Académie française when a Prix de Rome for the genre was established in 1817. Finally, Jean-Baptiste-Siméon Chardin was able to create still life paintings that were considered to have the charm and beauty as to be placed alongside the best allegorical subjects. However, aware of this hierarchy, Chardin began including figures in his work in about 1730, mainly women and children. Though European academies usually strictly insisted on this hierarchy, over their reign, many artists were able to invent new genres which raised the lower subjects to the importance of history painting. Reynolds himself achieved this by inventing the portraiture style that was called the Grand Manner, where he flattered his sitters by likening them to mythological characters. Jean-Antoine Watteau invented a genre that was called fêtes galantes, where he would show scenes of courtly amusements taking place in Arcadian setting; these often had a poetic and allegorical quality which were considered to ennoble them. The hierarchy of genres also had a corresponding hierarchy of formats: large format for history paintings, small format for still lifes. This had occasionally been breached in the past, especially in large Flemish works, and the monumental The Young Bull of the Dutch artist Paulus Potter, as well as the larger of the two Butchers' Shop canvases of Annibale Carracci. But for the most part the relative prices obtainable for the different genres ensured the hierarchy of size also; it would not have been economic to paint a very large subject from the lower genres, except for commissioned group portraits. Rubens' largest landscapes were painted for his own houses. After history painting came, in order of decreasing worth: portraits, scenes of everyday life (called scènes de genre, or "genre painting", and also petit genre to contrast it with the grande genre), landscapes, animal painting, and finally still lifes. In his formulation, such paintings were inferior because they were merely reportorial pictures without moral force or artistic imagination. Genre paintings—neither ideal in style, nor elevated in subject—were admired for their skill, ingenuity, and even humour, but never confused with high art. He who produces perfect landscapes is above another who only produces fruit, flowers or seashells. He who paints living animals is more estimable than those who only represent dead things without movement, and as man is the most perfect work of God on the earth, it is also certain that he who becomes an imitator of God in representing human figures, is much more excellent than all the others ... a painter who only does portraits still does not have the highest perfection of his art, and cannot expect the honour due to the most skilled. For that he must pass from representing a single figure to several together; history and myth must be depicted; great events must be represented as by historians, or like the poets, subjects that will please, and climbing still higher, he must have the skill to cover under the veil of myth the virtues of great men in allegories, and the mysteries they reveal". The size of paintings, and very often the prices they realized, increasingly tended to reflect their position in the hierarchy in this period. 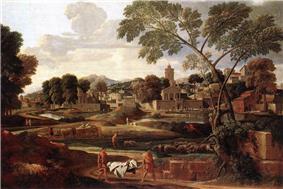 Until the Romantic period the price and saleability of what were essentially landscapes could be increased by adding small mythological or religious figures, creating a landscape with..., a practice that went back to the beginnings of landscape painting in the Flemish world landscapes of Joachim Patinir in the early 16th century. Flemish Baroque painting was the last school to often paint the lowest genres at a large size, but usually combined with figure subjects. The hierarchy was mostly accepted by artists, and even genre specialists such as Jan Steen, Karel Dujardin and Vermeer produced a few history paintings, which were better paid when commissions could be obtained, but in general far harder to sell. The unhappy history of Rembrandt's last history commission, The Conspiracy of Claudius Civilis (1661) illustrates both his commitment to the form and the difficulties he had in finding an audience. In Flanders, as well as great quantities of pure genre works, there was a trend towards history paintings with a major genre element, whether animals, landscape or still life. 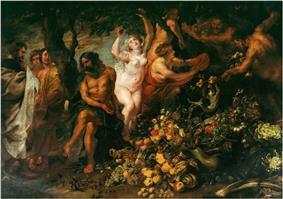 Often the different elements were painted by different artists; Rubens and Frans Snyders often co-operated in this way. The new genres of landscape, genre painting, animal painting and still life came into their own in the 17th century, with the virtual cessation of religious painting in Protestant countries, and the expansion of picture buying to the prosperous middle class. Although similar developments occurred in all advanced European countries, they were most evident in the enormously productive schools of Dutch Golden Age painting and Flemish Baroque painting. However no theorists emerged to champion the new genres, and the relatively small amount of Dutch theoretical writing, by Karel van Mander, Samuel Dirksz van Hoogstraten, Gerard de Lairesse and others, was mostly content to rehash Italian views, so that their writings can seem oddly at variance with the Dutch art actually being produced in their day. 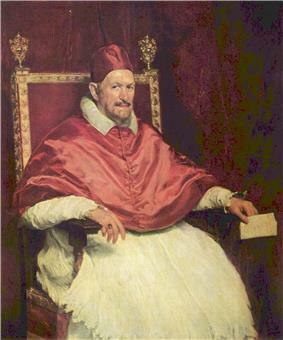 Many portraits were extremely flattering, which could be justified by an appeal to idealism as well as the sitter's vanity; the theorist Armenini claimed in 1587 that "portraits by excellent artists are considered to be painted with better style [maniera] and greater perfection than others, but more often than not they are less good likenesses". On the other hand, numbers of courtly sitters and their parents, suitors or courtiers complained that painters entirely failed to do justice to the reality of the sitter. During the Renaissance landscape, genre scenes and still lifes hardly existed as established genres, so discussion of the status or importance of different types of painting was mainly concerned with history subjects as against portraits, initially small and unpretentious, and iconic portrait-type religious and mythological subjects. For most artists some commitment to realism was necessary in a portrait; few could take the high-handed approach of Michelangelo, who largely ignored the actual appearance of the Medici in his Medici Chapel sculptures, supposedly saying that in a thousand years no one would know the difference (a retort Gainsborough is also said to have used, with a shorter timeframe).